Several harmful chemicals are produced in the manufacturing or disposal of plastic #3, such as lead, DEHA and vinyl chloride. These can lead to various health risks, such as birth defects, hormone disorders and cancer. We can also consume these chemicals after they work their way into the environment. It is best for your health to avoid plastic #3. Due to its adverse health effects, plastic #3 should be kept away from heat and not used to store food. 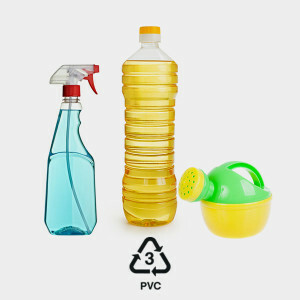 Common objects made with plastic #3 include crystal/cling wrap, cooking oil bottles and some clear food packaging. Many toys are made from PVC plastic and so could pose a serious health risk to children. While industry groups claim that their toys are safe, the Center for Health, Environment and Justice has serious concerns. Regardless, it is always a safe bet to avoid plastic #3 altogether because of its toxicity. Plastic #3 can be recycled into decks, paneling, mats, mud flaps, roadway gutters and speed bumps.